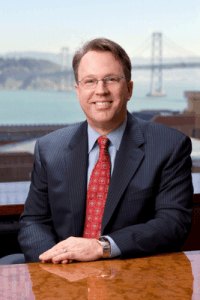 John C. Williams, President & CEO of the Federal Reserve Bank of San Francisco, presented a lecture titled The Current Economic Forecast earlier this month at the Bishop Ranch Forum in San Ramon. The tone of Mr. Williams’ presentation was one of optimism and he highlighted the dual goals of the Federal Reserve’s monetary policy throughout the lecture: maintaining maximum employment and keeping inflation at 2% on average. Mr. Williams pointed to the current employment rate as proof of the strength of our nation’s economy over the last few years; it is the best single indicator of the labor market. The natural rate of unemployment is around 5% and that is the Fed’s goal. In 2009, Mr. Williams reminded the audience, the United States had 10% unemployment and now the figure is down to 4.9%. So, the overall labor force participation indicates quite good health for our economy. However, some indicators haven’t improved. For example, there are a lot of part-time workers who want full-time employment and have not been able to receive it. No matter the state of the economy, there will always be people who choose to leave the labor force (individuals seeking to take of children or elder parents, retirees, et cetera). Hence, the natural rate of unemployment is calculated to be 5%. Another sign of the strong economy, Mr. Williams pointed out, is that a lot of Americans are electing to quit their jobs. This indicates that Americans believe they’ll find new opportunities easily. The number of job vacancies right now is at its highest point since 2000 (when this metric first began to be collected). Mr. Williams then answered a question frequently posed to him: with so much tumult around the globe—slowing growth in China, political and economic unrest in Brazil, an immigration crisis in Europe, widespread violence across the Middle East—how is it possible that the U.S. economy keeps growing? In answering this query, Mr. Williams pointed to the strength of domestic demand and how imports remain quite cheap. The U.S. also continues to add jobs in the services sector, particularly in private industry, which has compensated for the steady loss of domestic manufacturing jobs. Wage growth has started to pick up as well. The Fed’s strategy of keeping low interest rates has helped drive growth too. In regards to inflation, Mr. Williams emphasized how the Fed is focused on moving inflation towards its goal of 2%. High inflation and low inflation are of equal concern to the Fed and Mr. Williams attributes the presently low inflation rate of 1% to largely international factors. The plunge in oil prices, which have fallen approximately 70% since June 2014, has contributed to low inflation. Mr. Williams and his counterparts at the Fed do not want oil prices to drop any further; this would serve to destabilize overall inflation. As for concerns about Asia, Mr. Williams acknowledged that developments in China have had a large impact on the global economy. He does expect continued challenges for the Chinese as their nation pivots towards a consumer service economy. Looking further ahead, Mr. Williams made a few predictions. “In the next 12 months, we’re targeting economic growth to be 2.4%. Unemployment will decrease down to 4% and inflation will move back up to 2%.” Driven by data (“we have hundreds of economists studying the big picture”), the Fed decided to raise interest rates back in December. Mr. Williams predicted that interest rates will be moved up another two times in the next year. “We’ll gradually move interest rates up to a more ‘normal rate.’ We don’t want to move interest rates too quickly. We also don’t want to run a ‘hot economy’ for too long.” Hiking up interest rates too quickly could lead to bubbles for asset prices and housing and also lead to high inflation. “It’s our job to take away the punch bowl when the party starts to get too fun,” Mr. Williams joked. After a hearty round of applause, Mr. Williams took a few questions from the engaged audience of executives. What is the “new normal” for interest rates? Historically, ten years ago, I would’ve told you that 4.5% is a normal interest rate, but the global trend is for lower interest rates. There is a shrinking labor force in some economies and measured productivity growth has been much slower. So, the new normal is probably 3.0% to 3.5%. The baseline is going to be lower in normal times. Do you see promise in blockchain technology? There is a broad effort to come up with a faster payment solution. Most of the Fintech is still occurring on the same old payment system, they’re just accessing it in new ways. Businesses are still using the credit card network and writing checks. There are regulatory issues that we’re thinking about as well. Fintech is often very closely connected with banks. We are definitely worried about the safety and security of the banking system and blockchain does have a lot of potential. Last month, your colleague, President of the Federal Reserve Bank of Minneapolis Neil Kashkari, said: “The biggest banks are still too big to fail and continue to pose a significant, ongoing risk to our economy.” Do you agree and should we break up the big banks? There were a lot of lessons learned from the last financial crisis and recession. After the financial system froze, we worked to make sure our system is more resilient. So, we’re demanding a lot more capital and liquidity in banks, particularly in the largest banks, so that they are able to weather the difficult times. We enhanced the stress tests for the biggest banks and we increased the supervision of the banks with regard to risk management. What Dodd-Frank requires is that all banks have a feasible plan to close their company without having a huge impact on the financial system; if you can’t be shut down in a bad time, then your bank needs to be reorganized. We’ve created incentives for banks to not get too big. Remember, in the past, people said to break up IBM and break up Microsoft.